This hat is the perfect mate for the Anemoi Mittens by Eunny Jang. Let the cold winds blow! Please post any comments, corrections, or improvements. Also, send links to photos of your own Anemoi Hat. 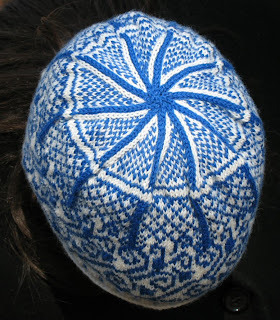 The pattern is written to fit a medium-sized head (about 21-22 inch circumference). You should be able to adjust the size by adding or subtracting a pattern repeat and proportionally reducing or increasing the cast-on. I made this a bit loose because I intend to sew in a fleece liner. 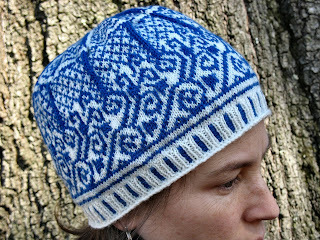 If you do not want to line the hat, knit in a smaller needle size. 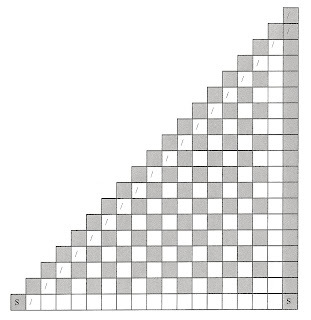 For lack of a legend, read the charts thus: shaded squares are CC, white squares are MC, S = slip stitch purlwise with the yarn in back, / = knit 2 together. Using circular needles, CO 160 st. Place marker, join to work in the round being careful not to twist. Knit one round. Rib round 1: Attach CC; k1MC, k1CC, *k1MC, p1MC, k1MC, k1CC, rep from *, end k1MC, p1MC. Rib round 2: k1MC, p1CC, *k1MC, p1MC, k1MC, p1CC, rep from *, end k1MC, p1MC. Repeat round 2 eight more times or until desired length of ribbing. Increase round: With MC, *k4, m1. Repeat from * to end of round. 200 st. Follow chart one. Eliminate or repeat diamond pattern (red bracketed section) for smaller or larger sizes. 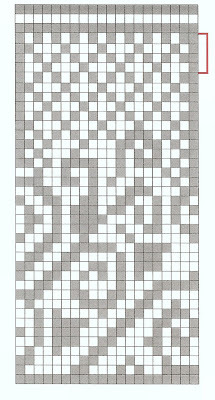 Slip Stitch decrease round one (round 1 of chart two): With MC only, *sl1wyib (this will be in CC), k16, k2tog, sl1wyib (this will also be in CC). Repeat from * to end of round. Resuming stranded colorwork, continue following chart two until there are 10 st remaining. K2tog five times so that there are 5 stitches left, break yarn and thread it through remaining stitches. Pull tight, weave in ends. Weave in all ends and block hat thoroughly. Sew in fleece liner. Fantastic! That's great that you got permission from Eunny to post this! How is it possible that a hat that looks this complicated has such a short pattern?? Well?? And what Liz said, too. lovely! just lovely! I'll be curious to see how you line it. It turned out great! Thanks for the pattern. Such a beautiful hat. 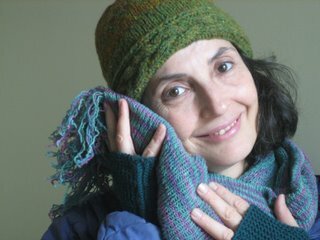 Thank you for sharing the pattern and your finished hat picture. I LOVE this hat! I'm going to try to make it in red & white for my daughter. I've never seen Wildfoote yarn here where I live. Can you give me any idea what other yarns might be comparable in size? i found this pattern through ravelry, it looks amazing. I also took a look through your blog -- it's a knitting inspiration. just wanted to leave a few works of encouragement for what you're doing. I just recently taught myself to knit and have made a few intermediate hats. I'm excited to try this one now. Thank you so much for posting this. You do beautiful work!